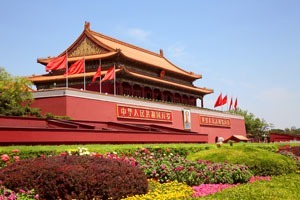 Tian&apos;anmen Rostrum, many would say, is where modern era China began in 1949. 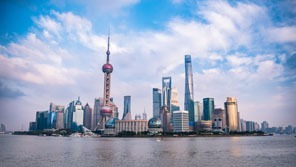 The purpose of this description of China is to give our customers insight into and forewarning of the differences between China and the West that are connected with China&apos;s "developing" nature. We also wish to assure you that we are always doing our utmost to consider your needs and preferences. 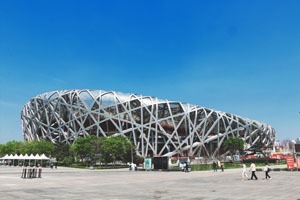 Beijing is developing fast and ostentatiously, as shown by bold buildings like the Bird&apos;s Nest. China&apos;s development can be seen economically. With an annual growth averaging 9%, China has had the fastest growing major economy for the last 30 years. 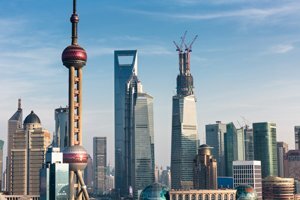 Construction is going on at an unprecedented pace, with China using half of the world’s concrete and a third of the world’s steel, and producing nearly half of the world’s tall buildings on a year-by-year basis. Day and night across urban areas, tower cranes rotate like dials on a complicated machine. See China Facts. Driven by the increase in cars, there is a huge amount of road upgrading and new highway construction. 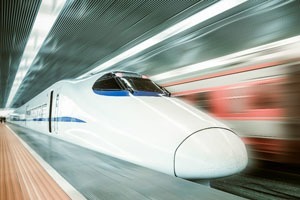 China is also in the process of spending $200 billion on railways by the end of 2011, including high-speed intercity links that will half traveling time for those who can spend the extra money. It is predicted that China&apos;s middle class will leap from around 100 million to 700 million people by 2020. There are a fast-growing number of citizens rich enough to own cars, with private car ownership soaring from 10 million in 2003 to a predicted 130 million by 2020. China&apos;s urbanization has also been a phenomenon with 300 million people moving to cities over the last 30 years and another 300 million predicted to move from rural to urban in the next 30 years. China has 6 megacities (urban areas of 10 million inhabitants — see above). This compared to 5 in India, 3 in Japan; 2 in the USA, Pakistan, and Brazil; and 1 in 17 other countries. The crown of business buildings in Shanghai befits its status as largest and richest city in China. 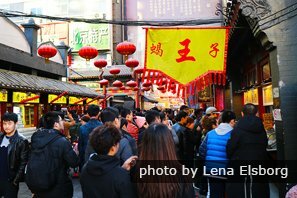 China (including Taiwan) has 21 cities of over 5 million people (Shanghai, Beijing, Guangzhou–Foshan, Tianjin, Shenzhen, Chengdu, Taipei-Taoyuan, Dongguan, Chongqing, Shenyang, Wuhan, Hong Kong, Zhengzhou–Xingyang, Hangzhou, Quanzhou, Nanjing, Suzhou, Qingdao–Jimo, Xi&apos;an–Xianyang, Fuzhou, Harbin), whereas the USA has 11, India 9, Japan 3; Brazil, Indonesia, Nigeria, Pakistan, Russia, and Vietnam 2, and 29 other countries have 1. So China has 25% of the world&apos;s 85 five-million-person cities. China has 24 of the world’s 100 largest cities, compared to 12 for the USA, 9 for India; 3 for Brazil, Indonesia, and Japan; 2 for Nigeria, Pakistan, Russia, Spain, Turkey, and Vietnam; and 1 for 24 others. China has over 100 built up areas of over 1 million people! The other three are The Java Region (145 million), The European Backbone (120 million), and The Tokyo Region (80 million). See more on China&apos;s Top 10 LARGEST Cities. Our guides are trained to be tuned to developed world expectations and service standards. 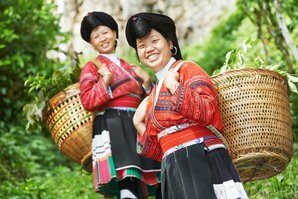 China Highlights aims to be, as far as is possible, a travel agency with developed world service in a developing country. Most of our customers come from developed countries and we are aware that there are expectations that come with that. We try to accommodate these expectations in every way we can. Though China won&apos;t become developed overnight, we try to make our service like that of a developed country. It is often said that China is a developing country and the West is developed. Countries who are "developing" want to be "developed" and it seems there is none working harder at it than China. But what makes somewhere developed? Is it tall buildings? No, some very developed places have no tall buildings. Is it being rich and driving a car? No, developed countries have poor people and those without cars. Common measures of development include certain standards of living and health care, with statistics like disposable income and age demographics compared. Some would say "being developed" is measured by how a country looks after the needy among its population. It is expected that those in a developed country have better standards of education. China is developing on all these fronts at a rapid pace. However, there is one area that seems to be lagging behind, which can&apos;t be fixed by more technology and isn&apos;t found on the curriculum, and that is the development of behavior. Many Chinese say, "We are very casual," doing as they please, as if it is a fact of the culture, even something good. However, doing as one pleases can also be called selfishness, which can create some real problems when such a huge population have to co-exist. This is particularly a problem when the population are increasingly densely dwelling urban "strangers". Despite government restrictions on the Internet, foreign media like movies, music, news and sports coverage are becoming increasingly available in China as an inevitable consequence of economic development. Access to these things can be very formative of Chinese impressions of the West and what is fashionable and acceptable. Unfortunately the offensive language and the morality of Western media can give an unfavorable impression of the West, and what Westerners approve of. Not only that, but the less desirable words and actions from the media are more likely to be the ones that are copied, particularly by Chinese youth. 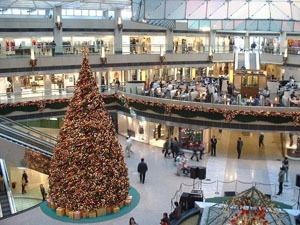 Thanks to increasing knowledge of the West, Christmas is becoming more popular in China, particularly in retail, schools and companies with overseas connections. However, the decorations often are left up far longer than what would be considered decent in the West, and sometimes all year round! Copying Western customs and language is seen as fashionable in many arenas, but is often done in a Chinese way. There is a tension between wanting to be international and modern, experimenting with all things Western, and maintaining a Chinese identity. We recognize that most developed countries have no smoking in public places and smokers are careful not to smoke near non-smokers. This is not the case yet in China, apart from in most buses and train carriages and of course airplanes. Now many public places are becoming non-smoking, despite difficulties enforcing it, with Beijing leading the way .More poor people smoke than rich, and more people in less-developed countries smoke than in developed ones. Smoking is prevalent among the male population of China. It is even a custom to offer a male guest cigarettes. China Highlights do our best to reduce our customers exposure to smokers. For example our drivers are not allowed to smoke whilst driving. We also recognize that in developed society people have personal rights and freedoms (e.g. to smoke, get drunk, listen to loud music, etc. ), however, nobody has the right to harm or cause discomfort to someone else by their actions. In China, limiting behavior for the sake of others, is not as commonly practiced or enforced. However, the Chinese virtue of tolerance ensures that that daily life generally goes on without a fuss. In China things like freedom of speech and the media, and illegal drugs, are more tightly controlled and heavily penalized. Be particularly careful about speaking out about sensitive issues and staying on the right side of the Chinese law, so as not to cause trouble. There are no laws in China to confine noise to certain places or limit the disturbance caused by things like construction and bars. Rules are now being established for city residential areas . If you are particularly sensitive about noise, let us know and we can make inquiries to find the quietest hotels and places to go. Rural or working class Chinese may talk (shout) like they&apos;re calling up a mountain or across a construction site for everyday conversation. Don&apos;t worry: this is not a sign of aggression or an argument, just force of habit, or possibly reduced hearing from being around loud machinery with no ear defenders. Apps have taken over life in China. One of the bi-products of China&apos;s development and increasing wealth is the growth in cell phone ownership. China easily has the most cell phones of any country (almost 1.3 billion or one per person on average) . With mobile phones coming into mass use so quickly there hasn&apos;t been time for a development of cell phone etiquette similar to in the West . New cell phone users shouting down their devices in inappropriate places has decreased now, especially in the cities . Now , apps have taken over, and any routine task or any spare moment seems to be spent head bent over a smartphone. Here China&apos;s development has outstripped the rest of the world in some respects. 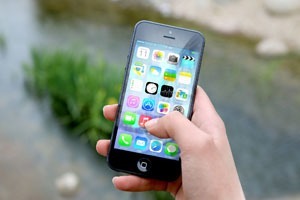 See more on The Top 10 Apps for Use in China. China&apos;s army of street cleaners do a great job, but it would be better if litter was not so readily dropped in the first place, especially in the countryside where there is no-one concerned with picking it up. Aspects of behavior like not littering are catching on in the larger cities. Beware: public toilets are often in a terrible condition. 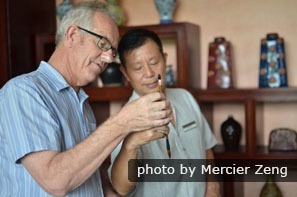 China Highlights tours will help you steer clear of China&apos;s "lowlights". We recognize that our customers come to see things they don&apos;t have at home, like the old things that have been preserved for posterity. Many Chinese, with there minds set on modernizing, would be embarrassed about showing Westerners the old streets. China Highlights have picked out the most interesting of these to give you a flavor of historic China that is both unique and genuine. China can be proud of its rapid development, and it is worth taking in during your tour, but we recognize this is not the first thing people from the West come to see (unless they have a particular interest in civil engineering or town planning). 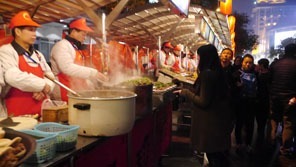 Beware hygiene and food quality risks at China&apos;s less-regulated street food stalls. Chinese have a fear of losing face and many don&apos;t want to appear "backwards". Street vendors are still a very common sight, but may be perceived as backwardness by Chinese. If you would like to experience this aspect of Chinese culture we will endeavour to steer you away from the distasteful shouting "DVD!" or "Hello, postcard!" and towards hygienic food stalls with glass covers and vendors who don&apos;t smoke and wear head coverings. China&apos;s opening up reforms and success on the world stage have brought many overseas tourists and business people to the cities and remoter places. Some Chinese have become used to regularly seeing foreign faces, however the vast majority of Chinese have not. Staring and pointing out "the foreigner" is common. While it may make foreign-looking people in China feel like animals in a zoo, it is something that people, in what is still an almost completely ethnically homogenous population, cannot help but do. China&apos;s development has resulted in an increasing gap between the rich and the poor, which in turn has led to a ripe environment for crime, despite stiff penalties for getting caught. Those without are trying to find an "easy", but illegal, way to tap into the wealth growing around them. Unfortunately, Western visitors are often singled out as targets for those engaged in illegal / semi-legal activities. Beggars and street sellers are not officially allowed to stalk and molest the public, but this may nevertheless be the experience of many, especially those that look foreign. There is a perception that all Westerners are rich and this means that thieves and even prostitutes, sometimes posing as masseurs, target Caucasians in particular. China Highlights do our best to protect our customers from the unwanted attentions of beggars, hawkers, thieves and other scams and illegal activities. See also our page on China Travel Safety. Beware: In China traffic doesn&apos;t stop at pedestrian crossings unless there are traffic lights, and not even then if a right turn is permited. Unfortunately ignoring traffic laws and not giving way to other road users makes China look undeveloped. Many of the following traffic problems are decreasing in the major cities, but are still evident in many places. Take care of the following if you hire a bike or walking the streets. Walking in the cycle and car lanes (jaywalking is prevalent and unchecked). Driving, riding motorbikes, cycling, etc. on the wrong side of the road. Road positioning is seldom considered, with most vehicles preferring to hug the middle of the road . Pulling out in front of others who have the right of way at roundabouts, road junctions, cycle paths, pedestrian crossings. Not giving way to others. Lines are larger and more frequent than in the West due to China’s huge population, especially at popular railway stations and tourist attractions. Queue jumping and pushing in is common, whether getting on a bus or getting ready to pay at a checkout. This extends to traffic on the roads, and even foot traffic on the pavements. People will suddenly come out of shops, side streets, etc. into the flow of (foot) traffic in order to exploit the slightest gap in bodies, forcing you to stop or go round them. Personal space and the etiquette of not obstructing the way for others is seen very differently in China, where space (and time it seems) is at a premium, and everyone must be quick to get their rightful share. At China Highlights, we believe in "customer first". 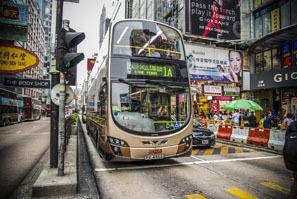 With a vast population increasingly having to share roads and facilities like buses and ticket offices, many individuals have developed a "me first" attitude in traffic, bus queues, etc. to get what they are entitled to as quickly as possible, though the opposite results for society in general. 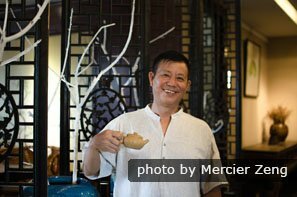 Although the "me first" attitude may prevail in the public zone until realization comes and the necessary adjustments are made, "guest first" still prevails in Chinese homes, and when you enter China as a "foreign guest" the same traditional courtesies will usually be extended to you. At China Highlights we think "customer first". You are the reason we exist.